[Jimmy Kimmel] brought up the subject of Romney’s recent appearance on “Live! With Michael and Kelly,” where the Republican expressed his preference for Snooki over Honey Boo Boo. Although Alana was unaware of Romney’s taste in reality television — or indeed, of Romney at all — Kimmel asked who she would be supporting this year. “Marack Obama,” she replied, as June quietly adjusted her daughter’s legs into a more ladylike position.Kimmel made a futile attempt at a follow-up question — “Is there any way that Mitt Romney can win your vote back?” — but by then Alana had moved on to making faces at herself in a camera off stage. Evidently her attention span is only slightly shorter than that of the average American voter. 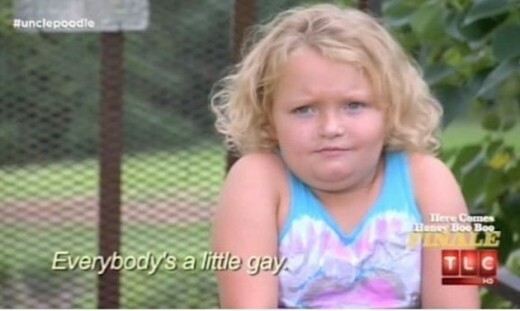 via Honey Boo Boo endorses Barack Obama on Jimmy Kimmel Live – latimes.com. Will the Honey Boo Boo voters be more important to President Obama than the Bubba voters? This entry was posted in Media, Presidential Politics and tagged Alana Thompson, Bill Clinton, Honey Boo Boo, Jimmy Kimmel Live, Mitt Romney, President Obama. Bookmark the permalink. FUNNY AND UNFORTUNATELY TRUE. If the attention span was greater for the average person, O would be running away with this election. Just paying attention to Romney for 10 minutes mean you can uncover ten lies.